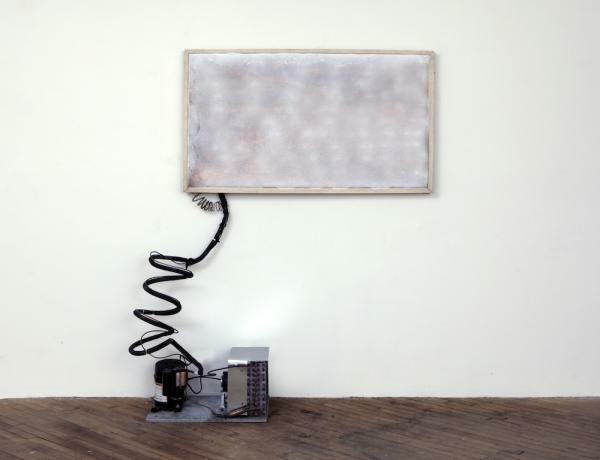 1708 Gallery is pleased to announce its upcoming exhibition, Jessica Segall: A Thirsty Person, on view from February 22 to March 16, 2013. Please join us for an artist talk and opening reception on Friday, February 22 from 6 to 8 p.m.
Jessica Segall’s work investigates the link between creativity and survival, focusing on the production of energy in practical and alchemical forms. A Thirsty Person shares new sculpture, drawings and video produced from Segall’s travels to remote places such as the Arctic and Mongolia, and explores themes such as risk, vulnerability and a conscious ecology through the development of off-grid technologies. The labor-intensive and often humorous work necessitates collaboration with video, sound, and costume design, and illustrates the uninhabitable places upon which we all depend for survival. 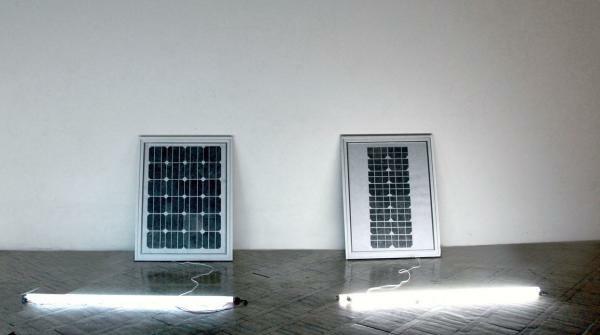 The exhibit includes a series of graphite abstractions drawn from solar panel cell patterns used by nomads in Mongolia. In these works, Segall captures two simultaneous moments: one in product design that evaporates with the development of nanotechnology, and one in pastoral nomadic culture that is increasingly affected by a growing mining industry and climate change. A Thirsty Person also displays a copper cold-plate made from salvaged freezer components, hung on the wall as a painting. A freezer compressor crystallizes the surface of the copper plate, creating a refracting projection screen that recreates the atmospheric conditions of the Arctic. A sequence of portraits and pastoral landscapes are projected in the video. In this video titled The Thirsty Person, Who Having Found a Spring, Rushes to Drink, Does Not Contemplate Its Beauty, Jessica wears a Goya-inspired survival suit designed in conjunction with Avery Jennings and made with arctic-grade materials and conductive metals. 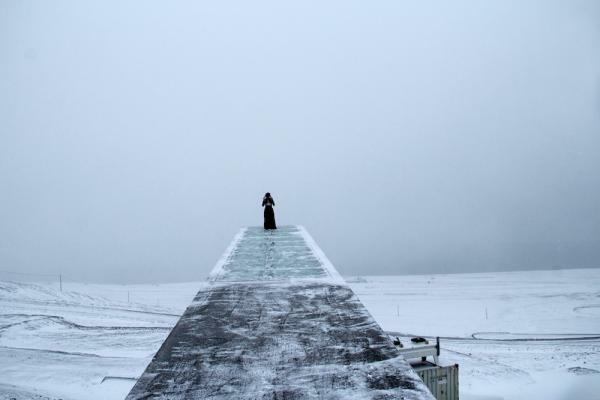 Her character reclines on icebergs and walks to the top of the Global Seed Vault, an international bank of seeds for safe keeping in case of global disaster. Segall visited the performance site to meet with researchers at The University Centre in Svalbard, a program that offers education in arctic biology, geology, geophysics and technology. Jessica Segall is an artist and musician living in New York City. Her work has been exhibited at the Havana Biennial, The National Gallery of Indonesia, The Queens Museum of Art, The Mongolian National Modern Art Gallery, and The Aldrich Museum and International Symposium for Electronic Art. Jessica is the recipient of an Art Matters grant, the l.i.a.e.p. Travel Grant, The Gatsby Charitable Foundation Fund, and an Emerging Artist Fellowship from Socrates Sculpture Park. She has attended artist residencies at Skowhegan, The MacDowell Colony, Land Art Mongolia, Sculpture Space and Künstledorf Schöppingen. Jessica is a graduate of Bard College and received her MFA from Columbia University. Jessica would like to thank Sculpture Space, the l.i.e.p. travel grant, Art Matters and The Arctic Circle for their support of this project. For more information, please visit www.jessicasegall.com.